Before scheduling a tee time, always ask if the club has specific attire rules or regulations. When playing a municipal course you may be allowed to wear whatever seems appropriate to you. Often ladies playing at a small local course will play in jeans and a T-shirt. However, this is unacceptable at most private, semi-private or resort style golf courses. The management at these courses will require players to wear what is considered proper golf attire. Although the requirements may vary slightly among courses, most dress codes are pretty standard. At most courses, women are asked to wear blouses with sleeves or sleeveless blouses with collars. 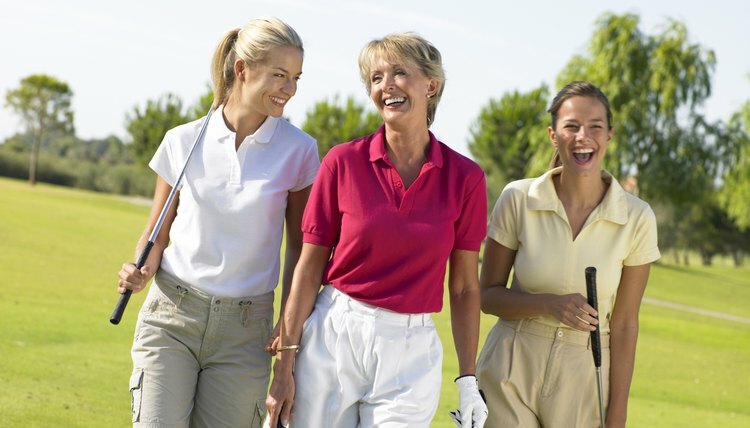 The most popular top for female golfers, however, is the polo-style shirt. These tops come in an array of colors and designs including button down, v-neck and zip-top in both short and long sleeves. In addition to plain colors, you may find these popular shirts in floral, stripes and other patterns. Turtleneck tops are also widely accepted. Inappropriate tops for the golf course include T-shirts, halters and tank tops. Dressing in layers is common for golfers. Wearing a vest or sweater over a turtleneck or polo shirt is one option on a cool day. You may also wear a collared button-down shirt, light jacket or wind shirt for additional covering. Denim jackets or sweatshirts are unacceptable. In the early spring or fall, slacks are most commonly worn by women on the golf course. On warmer days, shorter slacks such as capris, crops or shorts are advised. Shorter pants should be knee length or longer. Skorts (a combination of a skirt and shorts) and golf dresses are also popular choices. Jeans, sun dresses, sweats or athletic pants are all considered improper. To protect your skin and keep the sun out of your eyes, a cap or visor is advised on sunny days. With an array of styles, colors and fabrics, choosing a hat can be loads of fun. Some options include straw and crocheted caps, as well as hats with lots of glitz. Designer caps are also popular on the course. Golf shoes are required on almost all golf courses. Additionally, most courses will require that your spikes be non-metal (or soft). With shorter pants, skorts or golf dresses, low (or no-show) socks are most popular. With a longer pant, crew socks in colors that match the pants can be worn.